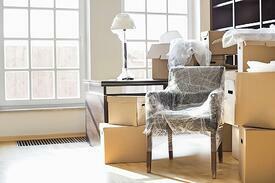 Moving has long been considered one of life’s major stressors and it doesn't diminish in intensity with practice. The potential for incurring damage adds to the anxiety, which is why moving companies urge people to take their time and plan before they pack a single box. Task 1: Measure door openings, stairways, hallways and the length, width and depth of large pieces to eliminate unpleasant surprises – and the temptation to force objects through unforgiving openings at your new home. Task 2: Detach small pieces – furniture legs, handles, lamp parts – and pack them together to prevent damage that can occur when they are jostled in the moving van. Task 3: Select the right box for each item. Follow a sensible rule of thumb – the heavier the item, the smaller the box. Task 4: Cover furniture with pads or blankets. It may be tempting to reach for plastic wrapping if you're rushing, but resist that urge. Plastic wrap doesn't provide the same level of protection. Task 5: Place corner protectors on mirrors and picture frames. Once secure, place the item in a mirror or frame box and fill the empty space with paper. Task 6: Protect floors, carpet, stairs and other high-traffic areas with nonslip runners. For large areas, it may be best to use self-adhesive plastic to ensure the best coverage. Task 7: Protect door frames with padding. The moving company may protest, but hold your ground. Think about the damage you could incur if a large piece of furniture dents a corner. Task 8: Place special items in the hands of a specialist. Pianos, grandfather's clocks and hot tubs are usually best entrusted to movers who have the special equipment to accommodate them. Your decorating style probably differs from that of the previous owner. But spend some time getting acclimated to your new home and the light patterns before making an in-home consultation with a window shade expert from Polar Shades. He or she can show you the many styles and colors that will allow you to put your signature touch on your new home – and turn one of life's major stressors into a major source of contentment.